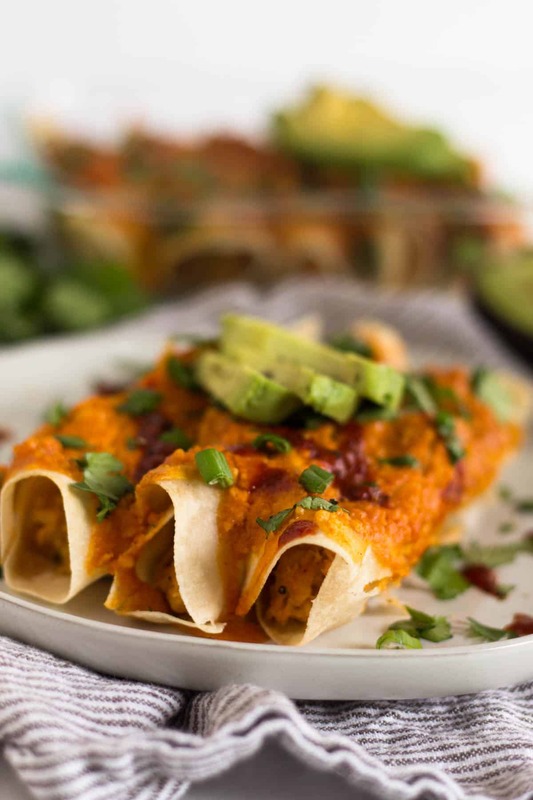 A comforting and healthy spin on enchiladas, these Cheesy Paleo Buffalo Chicken Enchiladas pack the flavor while being gluten, grain, and dairy free! 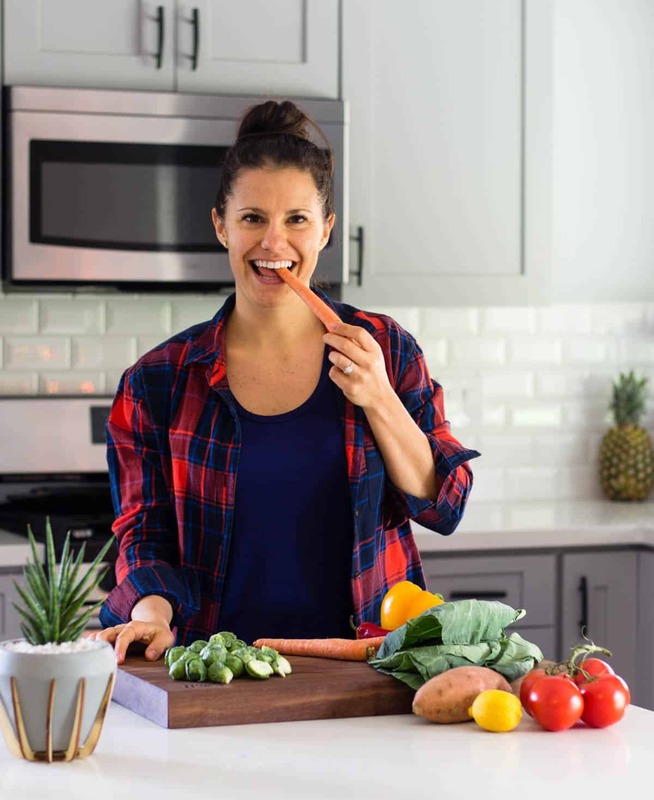 Thanks so much Vitamix for providing me with product and helping make this post possible! I was sent this product for free in exchange for an honest review, but all opinions are my own. 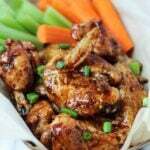 Welcome to my world of some of my favorite foods – buffalo chicken and Mexican! 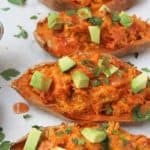 If y’all have been following along for awhile, you know I love a good buffalo chicken anything – hence these twice baked sweet potatoes, chicken tenders, and casserole. I’m also a huge lover of Mexican food – chips, salsa, tortillas, cheese, avocado, chili peppers…and I mean we live in Austin. Around ever corner you will find a taco stand. I try not to eat too much of it though because we all know chips and queso aren’t really good for the waistline. The other week I made a few enchiladas with some leftovers we had in the fridge that needed to be used up. This was only the second time ever I made them and it was just with random ingredients and I kinda became obsessed with them. The process is so easy and you can really put any spin on them you wanted. And thats when my creative juices got flowing! 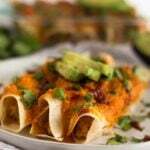 Why not combine my love for buffalo chicken with some enchiladas! 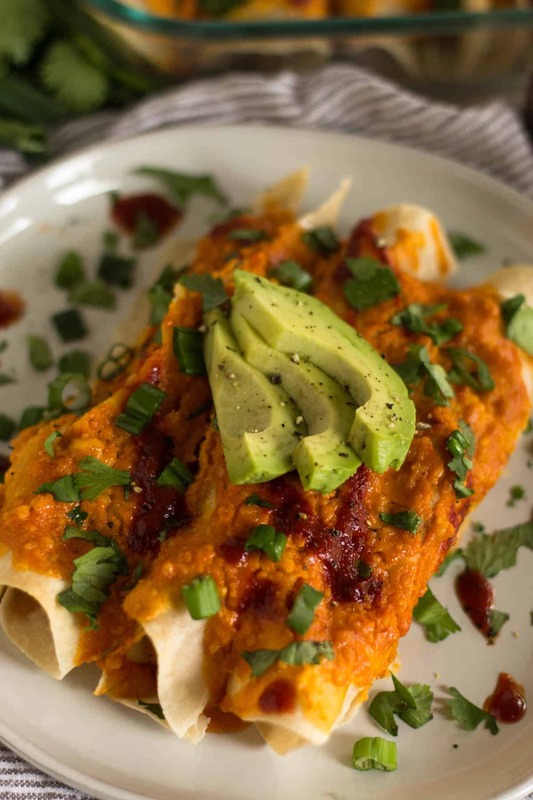 All you need is some leftover chicken, tortillas, a high powered blender for the sauce. 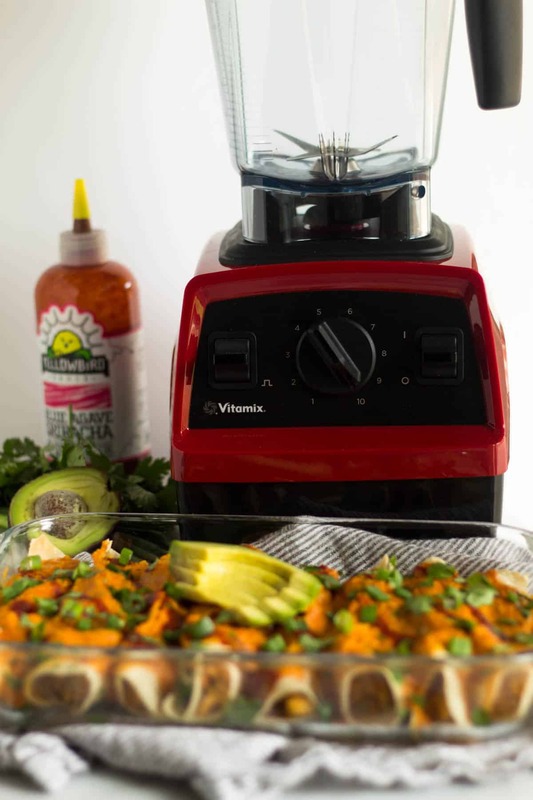 Vitamix was kind enough to send me their new Explorian Series E320 blender to create this recipe. To be honest, I absolutely love the Vitamix (6300 series) I was currently using and wasn’t in need of another one. But I’m so glad I tried the E320 out because it is perfect for our new kitchen! I love that it is not as tall and can fit under the cabinets, it’s also not as loud as my older model, and how they changed the size of the container. And it still has all the power that I know and love. Make sure to head on over to my Instagram because I giving one away!! The giveaway only last a few days, so make sure to check it out soon! I used my Vitamix to make the “cheesy” sauce, which actually has no cheese involved! 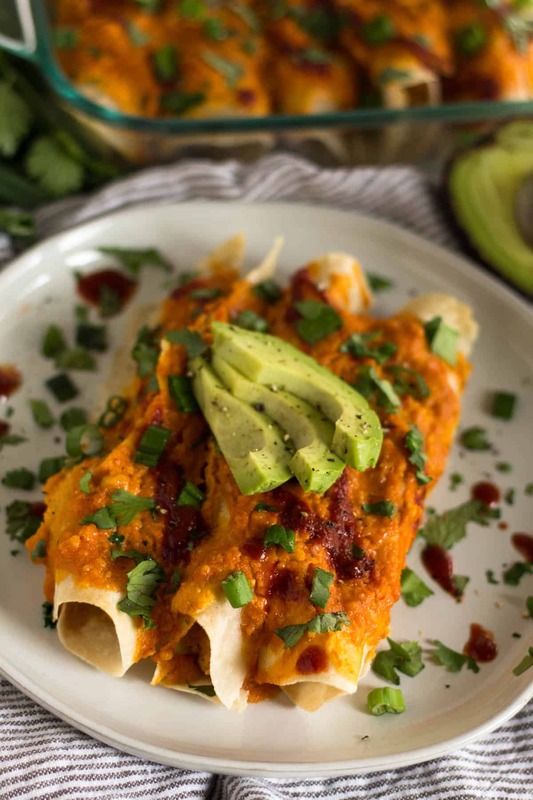 I blended up some soaked cashews with water, buffalo sauce, and nutritional yeast to make the thick, creamy, spicy, and cheesy flavored sauce that mixes with the chicken and then is spread all over the enchiladas before it bakes. I also used Siete grain free tortillas to make them paleo. 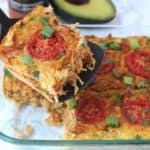 These make a great easy weeknight meal or would be perfect for meal prep in the beginning of the week. 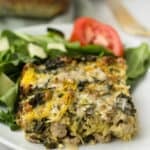 If you aren’t strictly paleo, any tortilla would work, and an addition of some cheese would probably be quite amazing! 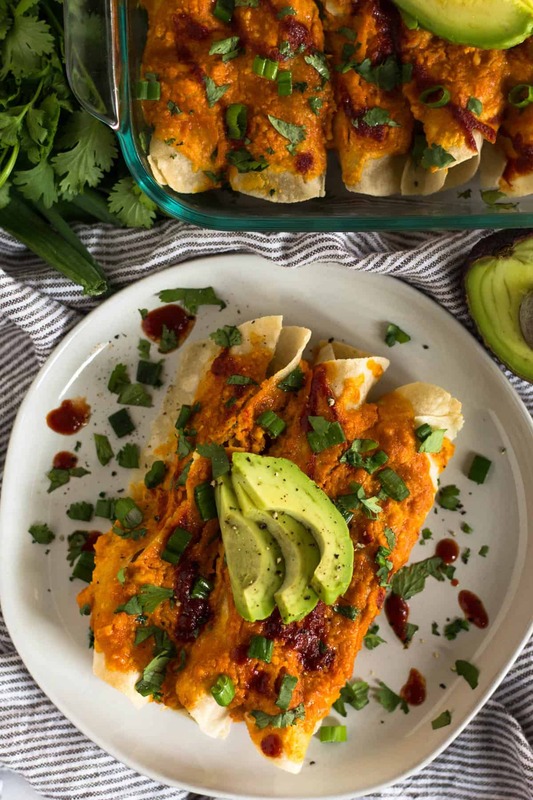 Top them with all the toppings too, our favorite is cilantro, avocado, and more hot sauce! Preheat oven to 350 degrees Fahrenheit and grease a large baking dish (about 10x7 or so) with avocado oil. Set aside. Make the sauce. Put all the ingredients for the sauce in a Vitamix, high powered blender, or food processor and blend until smooth and creamy. Set aside. In a medium bowl add shredded chicken, green onions, and 1/2 of the sauce. Mix well to combine. 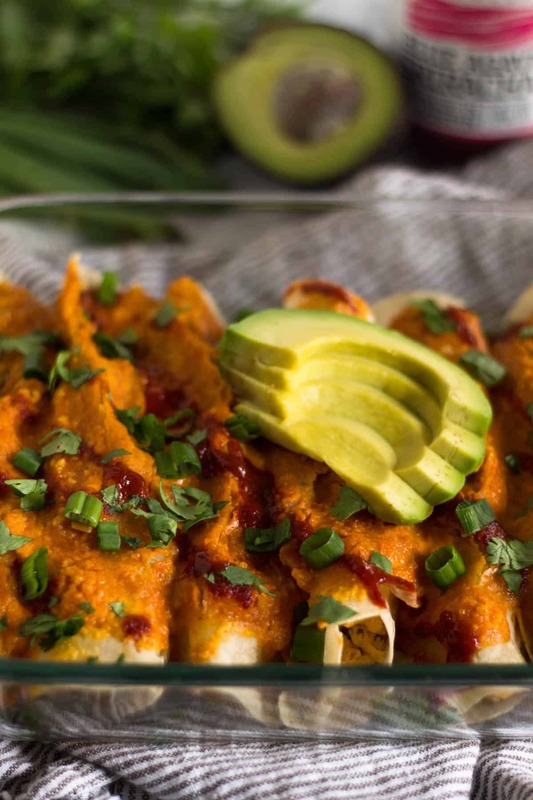 Make the enchiladas. 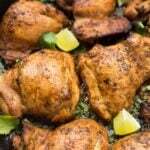 Add 1/4 cup chicken mixture to a tortilla and roll it up, placing it seam-side down in the pan. Repeat with remaining tortillas. 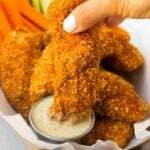 Cover with the remaining buffalo sauce. Bake for 20-25 minutes until warmed through. Top with toppings of choice. *Place cashews in a bowl. Cover with water. Let soak for at least 30 minutes or overnight (30 minutes if you are in a pinch).